Now you can move freely throughout your facility and never miss that important call. Call Alert informs you that have a call and who is calling you when you are not at your desk. No one likes to be screened. With Call Alert, the caller is notified that the system is in the process of locating the party they called while they hold for the connection. Little do they know that the party they are calling is receiving information on who they are and where they are calling from. The caller's satisfaction level is high as they feel that their call is important, have not been subjected to screening and they won't just be dumped into voice mail. The system is actually attempting to locate their called party without asking them who they are or what they want! The caller enters the extension number and the system plays A please hold while we page... (called party's name)...@At this point the call is held by Call Alert . At the same time a wireless message is sent to the called party's pager letting them know who is calling. The called party can decide whether or not they want or need to take that call at that time. Let's face it. Some calls are more important than others. Some calls you are willing to drop everything to take, while others can wait until you have the time to deal with them. (Some calls you may not want at all) Call Alert allows you to make an informed decision on whether or not you are in a position to take time to talk on the phone. If you want the call, simply go to any phone and pick it up; or, you may wish to let the call pass to voice mail, and deal with it at a later time. 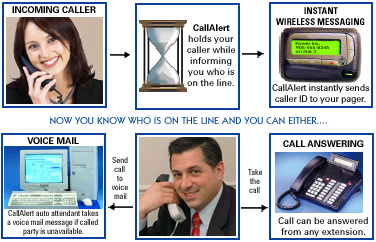 Once you receive the wireless text message giving you information on who initiated the call, Call Alert holds the caller for a pre-determined period of time ( this is definable ). After the timer expires, Call Alert transfers the call to your extension. When the call is ringing on your extension, you can pick it up there or from any other phone in your facility. If you don't pick up the call, it simply forwards to your voice mail and the caller is prompted to leave a message. Call Alert then sends you a wireless page telling you that there is a message, and what number and name ( if available ). Some facilities simply can not have intrusive noisy overhead paging. The Silent paging of Call Alert notifies employees anywhere in the facility they have a call. This is done without bothering customers, patients or other employees with annoying audio pages. In some facilities you can't hear audio pages due to noisy work environments. Noisy environments do not matter to Call Alert as its page is visual, not audible. The Call Alert pagers work throughout any size facility. Messages are sent directly to the pagers in visual text rather than in an audible format. Call Alert eliminates costly monthly fees paid to paging companies. It allows an automated attendant to process calls while at the same time performing valuable transparent call screening. This frees up human resources while at the same time increasing customer satisfaction. Call Alert also increases employee call handling efficiency. It allows them to move freely in performing their day to day tasks , while at the same time giving them the ability to take the calls they need to process immediately and putting off those of less importance. You now own your own on-site paging terminal. No more on-going monthly fees to the paging company. Call Alert integrates the power of an award winning call processing system with a world class on-site paging device. Call Alert empowers your employees with critical caller identification and activity information 7/24. Call Alert increases customer satisfaction while at the same time saving the enterprise time and money. You wont miss important calls. Pull important callers off hold - Get them while they are still on. You get instant caller ID notification, wherever you are. You know in seconds who leaves a voice mail message. CallAlert with voicemail - What is it? CallAlert integrates the power of an award winning call processing system with a world class on-site paging system. CallAlert with voicemail - How does it work? CallAlert is an automated attendant that instantly transmits the Callers ID Name and Number to a pager while the caller is forwarded to a persons extension. The person receiving the page can use any telephone in the building to quickly connect with the caller. The caller is automatically sent to voice mail if no one answers the page. CallAlert provides voice prompts to inform the caller that it is locating a person or that it is ready to accept a voice mail message. 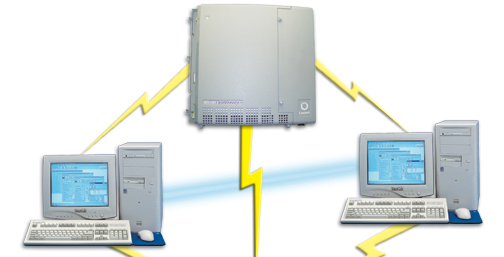 CallAlert works with VoiceGate ICS and most modern phone systems.